Marfione Custom Warhound flipper is a substantial tool built on a 6AL4V Titanium Frame Lock platform. This Warhound is a beefy tool with some serious heft thanks in part to the full length copper backspacer and hardware accents. 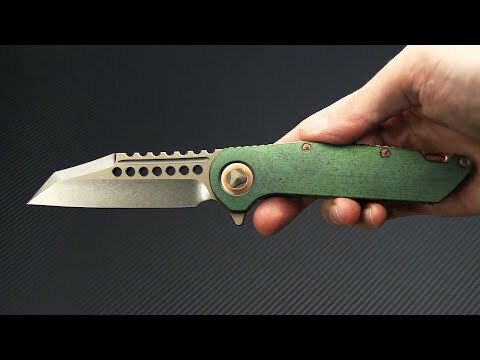 This custom flipper comes with a Two-Tone Bronze M390 blade and Antique Green anodized titanium handles and clip. Brand new item directly from Microtech Knives, USA. Blade: The intimidating Warhound blade combines powerful cutting performance with an aggressive look. Premium M390 blade steel was chosen for its edge retention and corrosion resistant properties and is equipped with a two-tone bronze finish with satin flats and tumbled grinds and swedge. Adding to the custom feel is the familiar Hellhound-grooved spine leading to the powerful and aggressive swedge at the tip. Milled holes and dual fullers add balance and style while the finger choil allows for excellent control for fine work. Handle: The 6AL4V Titanium Frame Lock construction is subtly contoured with chamfered edges for optimal comfort. Strategic jimping on the handles along with the full length jimping on the copper backspacer offer excellent traction. The Antique Green anodized finish is tumbled exposing the copper undertones which are highlighted by the copper pivot collar, over travel stop, hardware and backspacer. A hardened steel lock face delivers smooth, reliable operation on this massive flipper. Inside the frame the backspacer is marked with both Marfione's logos and names along with "014 08/2018 U.S.A.". Carries via a right hand, tip-up titanium pocket clip with matching finish. The knife ships in a display box with microfiber baggie and cloth, zipper pouch and signed Certificate of Authenticity plate. M390: Bohler M390 has become an extremely popular choice for high-end user grade knives thanks to its extreme edge retention. M390 also has a good corrosion resistance, meaning most users can avoid problems by simply wiping off their blade after each use. Another great feature of this steel is its ability to resist burr formation during sharpening. Comparable steels are CTS-204P and Duratech 20CV.